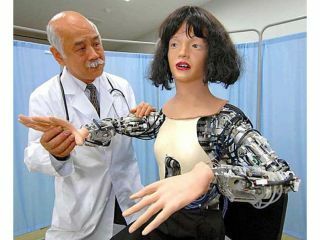 Gifu University's medical robot can mimic real human conditions. That fine-looking android you see in the photo to the right may look a little rough and ready but don't be fooled by appearances - it's actually the world's first fully symptomatic medical-condition simulator. The unnamed robot was created by researchers at Gifu University medical school for training medical students to diagnose tricky conditions. In this case, the machine displays symptoms of a condition known as myasthenia gravis , which is an autoimmune disease where antibodies attack the body's proteins, causing muscle weakness that is notoriously hard to diagnose. In future, the idea is to enable the 'droid to replicate many more conditions - for now, however, students have to make do with looking at its facial expression, posture and reflexes before asking, "Is it myasthenia gravis by any chance?"